It's a hard time being a monster! Hidden in their den, in the narrowest tunnels or in the dungeon of some ancient castle, the monsters' life is endangered by the 'heroes' - remorseless, bloodthirsty adventurers constantly in search for treasures. And if also the mighty Archmages fancy themselves with the hapless monsters, while battling their own millennia long struggle, what will be the fate of the little MiniMonFas? 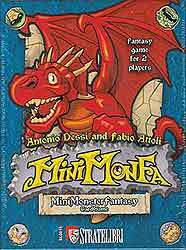 Everybody wants the skin (or fur, or hide) of the little MiniMonFas (Mini Monster Fantasy), the youngest and most unlucky among the monsters in every realm. Don the vest of the poweful Archmage, fight to rule the world, build your dungeon rooms and fill them with the little MiniMonFas... Add some traps and deadly pitfalls and send a party of your best adventurers to conquer your opponent's dungeon! But remember... Victory won't be secured till the last game turn.